Made by Philip Syng, Jr., American (born Ireland), 1703 - 1789. Made for Joseph Galloway, American, 1731 - 1803. Philip Syng, Jr., was well acquainted with the elaborate chased and repoussé work coming out of the best London shops, and this coffeepot achieves that high level of quality--perhaps because Syng employed London-trained engravers such as Laurence Hubert. 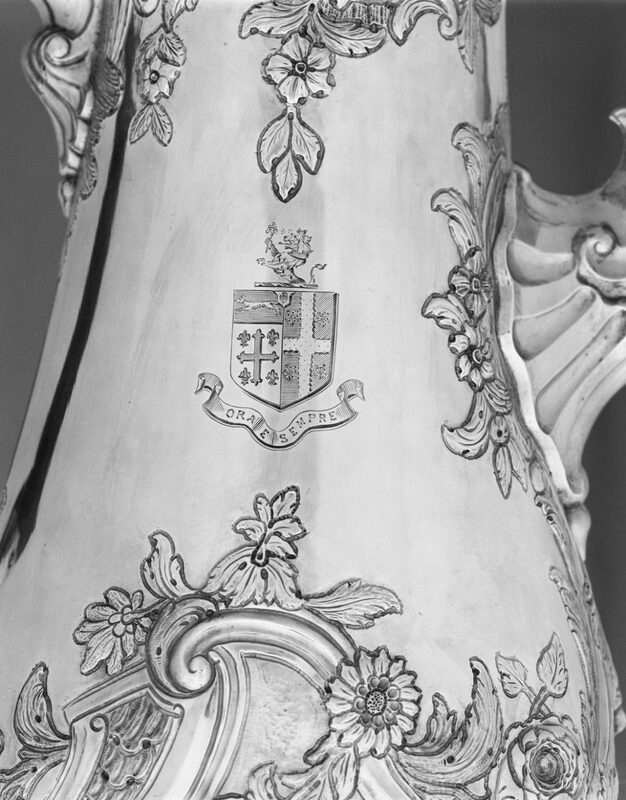 Hubert may have laid out the design on the pot, after which Syng would have "worked" the silver until he achieved the effect seen here: almost three-dimensional flowers and garlands. Joseph Galloway, who commissioned this coffeepot, was a native of Maryland. He entered Philadelphia politics in 1757 and rose quickly to a position of power. In 1776, he choose to remain loyal to the British Crown and returned to England, where he died in 1803. The engraved crest was added to the side of the coffeepot in 1890, when descendants of Galloway were married in Scotland. This coffeepot is an outstanding example of American silver in the Rococo style that first became popular in Philadelphia around 1750 due to the influx of objects and craftsmen from Europe. 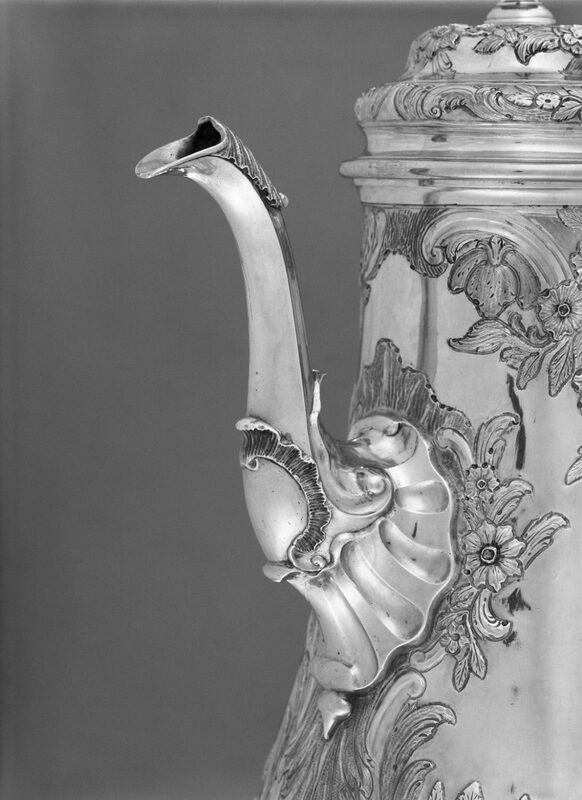 To suit the prevailing local taste for plain surfaces, most of the silver made in the Philadelphia workshop of Philip Syng, Jr., lacked ornament such as the sumptuous repoussé decoration of C-scrolls, flowers, and shells seen here. The client who commissioned this coffeepot, Joseph Galloway, clearly preferred furnishings in the latest London fashion. A loyalist to the British Crown, he fled to England in 1778, bringing this coffeepot with him. David Barquist, from Philadelphia Museum of Art: Handbook. Philadelphia: Philadelphia Museum of Art, 2014, pp. 264–265. 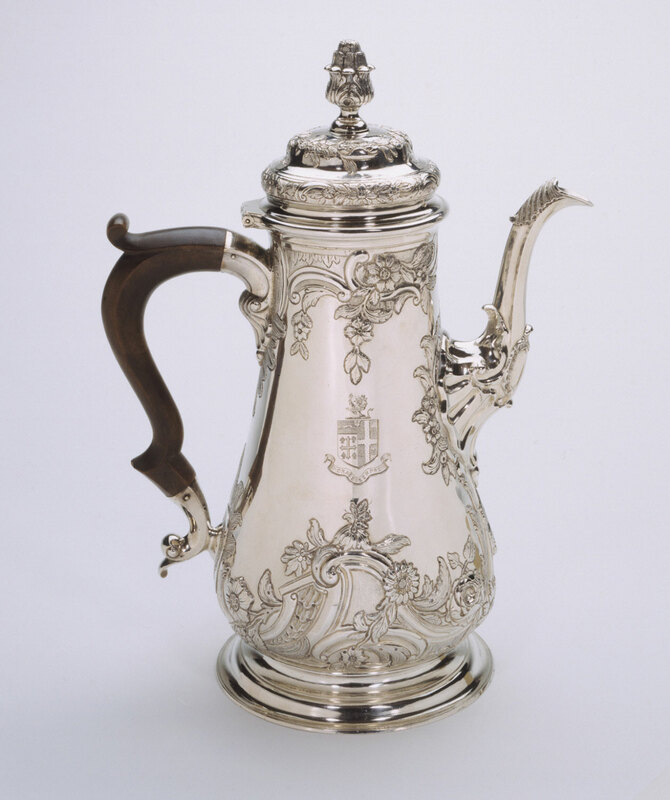 While closely related in form and design to silver made in London in the 1740s and 1750s, through the exuberance and individualized character of its decorations this coffeepot ranks among the most sophisticated examples of Rococo-inspired American silver from the third quarter of the eighteenth century. Its robust, single-bellied body recalls an earlier Baroque style, but its elaborate scroll and floral patterns are typical of the ornament produced by the London-trained chasers and engravers who were collaborating with master silversmiths in Philadelphia during the 1750s and 1760s. Because of the presence of these specially skilled artisans, this type of ornate silver decoration was more highly developed in Philadelphia than in any other colonial American city. One such craftsman was Laurence Hubert, a French Huguenot silver engraver, trained in London, who in 1748 arrived in the Philadelphia shop of Philip Syng, Jr., where this coffeepot was produced for the prominent lawyer Joseph Galloway. Its sophisticated design and abundant ornamentation attest to both the craftsman's ability and the wealth and confident taste of his patron. Jack L. Lindsey, from Philadelphia Museum of Art: Handbook of the Collections (1995), p. 262.